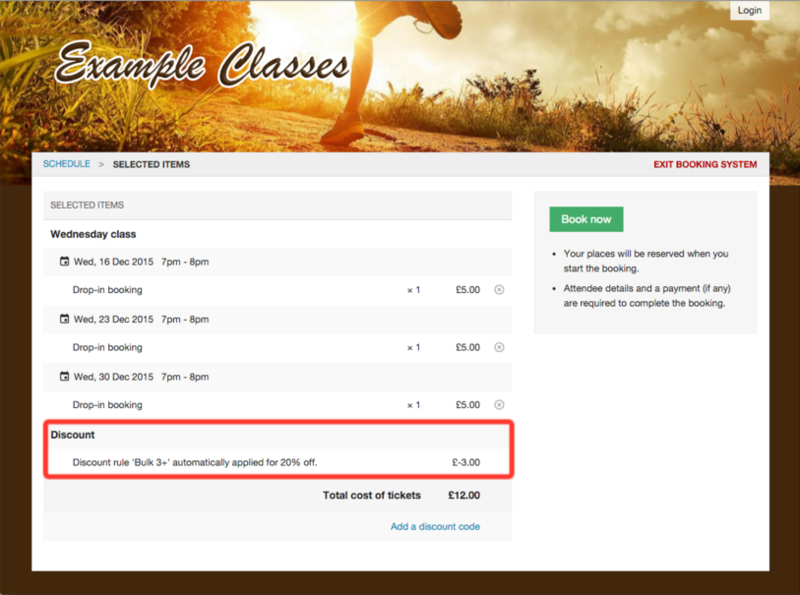 Block booking discounts can be automatically applied to bookings using discount rules. If the booker enters the specified number of tickets (or more) into their basket, then they'll receive an automatic discount at checkout. On the Settings - Discounts page, add a new discount set. Give the new set a name like 'Block booking discount'. This isn't seen by your clients. Click Add discount rules to specify what discount is to be applied. The Days in advance limit is the time-frame between events which determines whether a discount is given. E.g. if you'd only like to give a discount if tickets are purchased for 5 events within 6 weeks, then enter 42 days. If you tick the Only count separate events? box then discounts will only apply if the tickets purchased are for different events (rather than, for example, the customer and 4 friends on 1 event). Add usage restrictions to narrow down what tickets and/or entries the automated discount applies to. For example, if only 'drop in bookings' count then select that single ticket type. You might need to create additional discount sets to cater to different rules. If you have multiple entries with identical names don't forget to tag them all in. We recommend adding in some explanatory text under Tickets & Costs for the events that your offer covers, so it's obvious to your customers. For example "Book 3 or more tickets for 20% off!". For example, if you have different classes on Mon, Wed and Fri all with a fixed drop in ticket cost, then add the 3 tickets to the usage restrictions, and then a block booking discount rule for 20% off if 3 or more are booked at the same time. Live demo site: https://bookwhen.com/example-classes - Book 3 or more Wednesday classes.